"No Chinese". That's what Gadget Girl firmly stated when queried about the eats after hockey for Friday. Hey, I have no qualms with that sentiment. As I have stated over and over again, wonton noodles after hockey is fine and dandy; but it is hardly the first choice. In recent months, wonton noodles have been our only choice. All of our games are after 11:00pm. Terrible for our sleeping patterns and murder on our dining plans. Our original destination was 5 Point; but that was kiboshed since the response from the hostess regarding a table for 7 was "slim-to-none". Furthermore, the place is darn loud and dark. Don't know about you, I like to see and hear the people at my table. What we didn't have was a backup plan. Looking across the street, Emilicious and I briefly entertained the thought of Kwong Chow Congee & Noodle House. Nah. Gadget Girl would kill us. She may look sweet and innocent; but we know better! 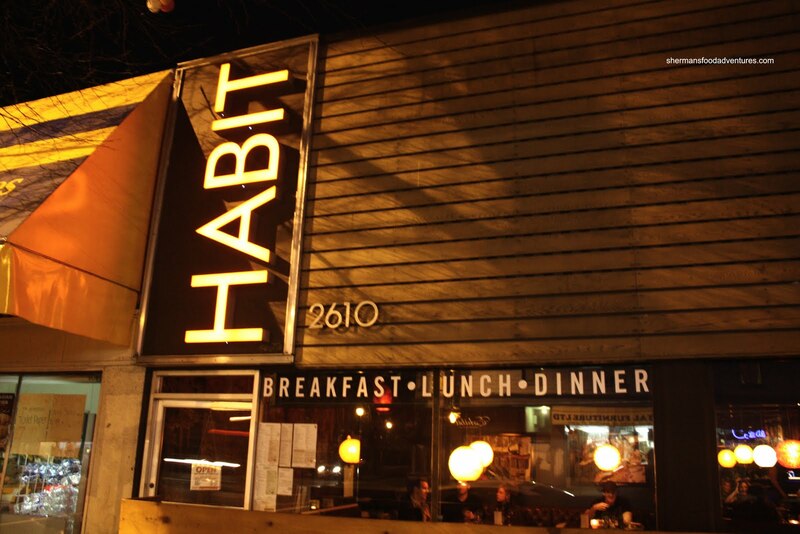 Luckily for us, only 5 blocks away lay Habit Lounge, sister restaurant of The Cascade next door. We sent Emilicious out first to snag a seat while I waited for Gagdet Girl. She drives as fast as a Corolla on #3 Road. However, it was frickin' c old, so I hightailed it to Habit and merely relied on leaving her a message. Much like always, when we finally settled in, I waited for everyone to make their decision before I made my order. Hey, no duplicates! My standard response? "I'm having what you're not having!" 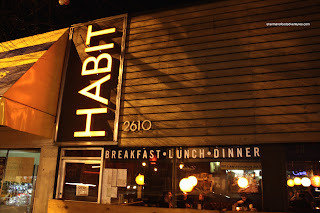 The one item that really stood out was the Habit Poutine. 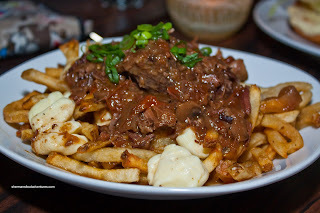 A artery-hardening concoction consisting of crispy fries, cheese curds, braised beef and jus, this was a fan favourite. There was so much beef and cheese, this was more filling than all the entrees we ordered. I really liked the squeaky cheese curds, there was a good mix of slightly melt ed and "as-is" pieces. The ample and tender braised beef gave the poutine body and richness. However, the jus ended up to be quite light and watery which made the entire thing a bit soggy. As if this wasn't enough food for me already, I also ordered the 2nd worst-dish-for-my-health in the Pork Belly. 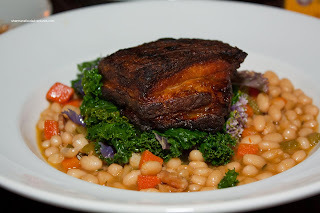 Consisting of a large piece of pork belly atop a white bean casserole with braised kale, this was another heavy dish. There was good and bad regarding the pork belly itself. It was quite tender on the inside with a bit of the fat being rendered. However, the exterior was a little tough and overdone. 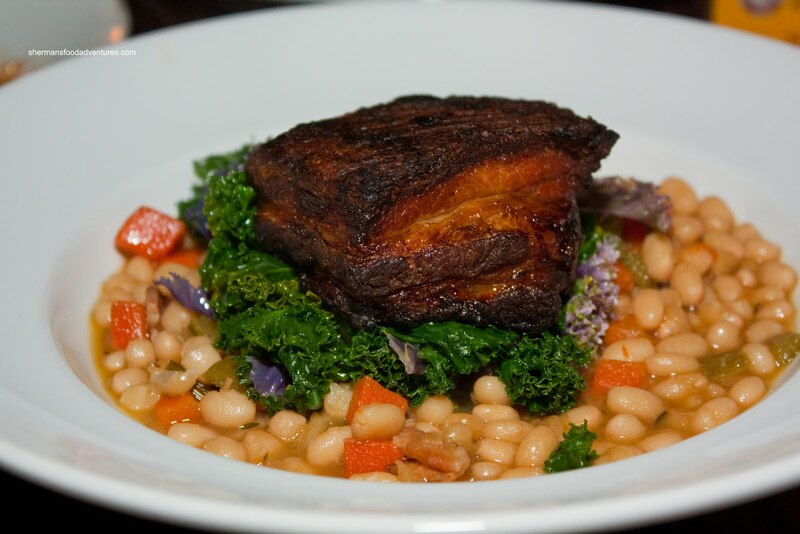 The braised kale was perfectly cooked as with the beans. Milhouse was debating whether to have something healthy vs. something cholesterol-ladened. Well, the Habit Burger with Pemberton Meadows beef & Fraser Valley pork, bacon and caramelized onions was too enticing to pass up. Make no bones about it, this was one big burger. He could barely fit it in his mouth. 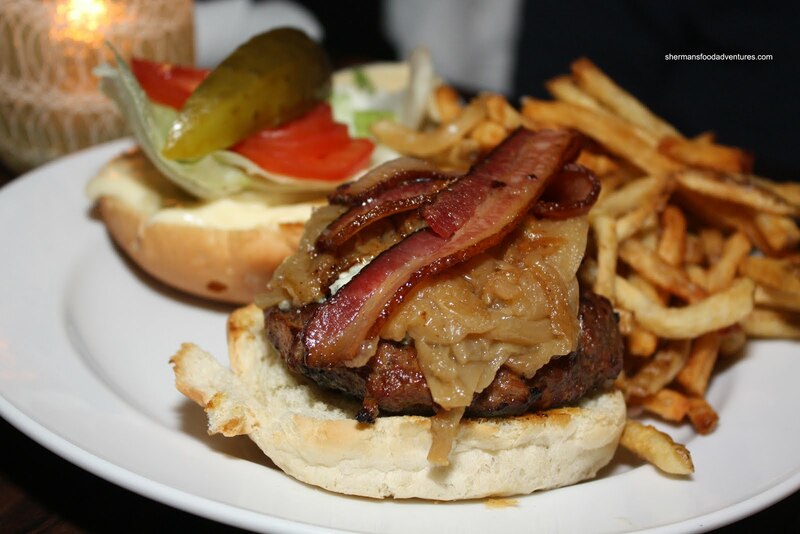 He remarked that the patty was moist while the bacon and onions complimented each other. 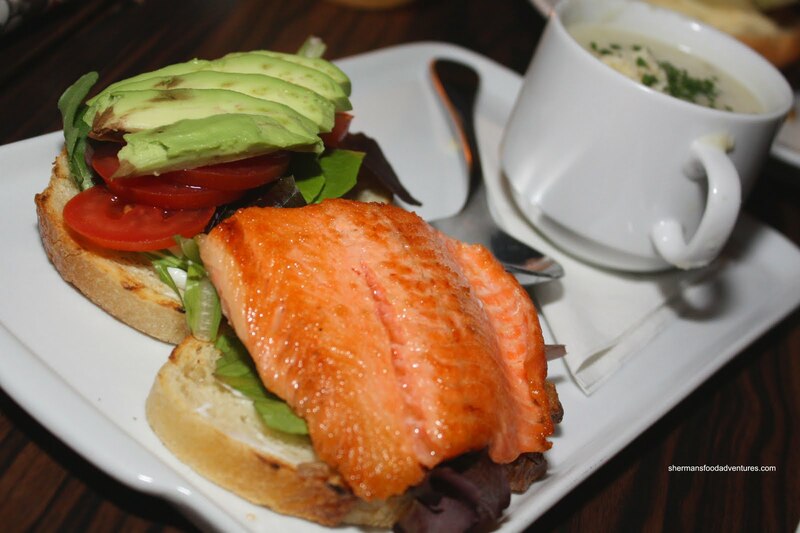 The "healthier" option that he didn't order was the Steelhead Club. Gadget Girl ended up with it instead. T he dish was nicely plated and very colourful consisting of a pan-seared steelhead trout, avocado, tomato, lettuce, red onion and cucumber yogurt. The trout was perfectly cooked being moist and buttery soft. Sweet Tooth was hungrier than usual. She ordered the Squash Gnocchi and ended up skipping dessert! The horror! Well, the gnocchi itself was naturally sweet, so I guess it was "dessert-like"? 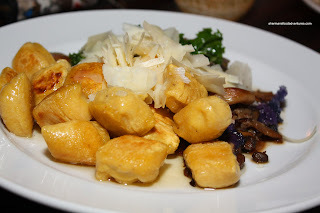 Although the gnocchi was pillowy soft, the slightly crisp exterior created a nice contrast of textures. The accompanying parts of th e dish consisting of mushrooms, zucchini, corn, kale, shaved Parmesan with sage brown butter was what really brought it all together. Emilicious went for something we thought was simple which ended up to be complex. The Grilled Cheese consisted of aged white cheddar and brie with an option to add truffle oil. Naturally, she said yes to the truffle oil. Oh boy. We could really smell and taste the oil. The combination of the brie and the earthiness of the truffle oil made for a very strong taste. Emilicious felt a bit overwhelmed by all of the components and commented how heavy it was. For me, I liked it as it is. Mind you, I only had one bi te. Silent Bob had the Chicken Club and man was it large. I had to slouch down to take this picture since there was not other angle possible. Lots of tender chicken combined bacon, lettuce, tomatoes and avocado, it was much like the burger - very tall. Overall, most of the food was solid with generous portions at reasonable prices. 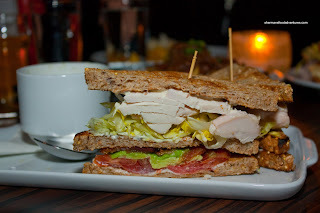 I think Milhouse summed it up best, "we got good food, great ambiance and it costs less than Cactus Club". Enuff said.